This exercise helps the horse reorganize its canter between the jumps, thanks to the ground poles. This work is particularly recommended for horses with a tendency to disunite the canter (cross fire) in turns. Michel teaches Dominique on Aiti. He executes the exercise at the same time with Nenuphar Jac to show his student the correct state of mind and body to reach the expected goal. 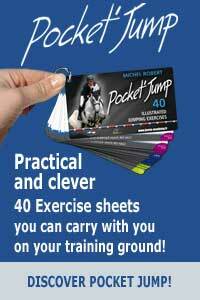 The rider’s priority is to correctly prepare and anticipate each step of the sequence of movements. 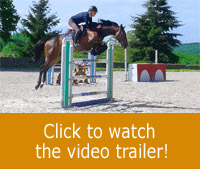 The set–ups with the flexy jumps are useful to get the horse to reorganize his canter between fences. For that, the rider has to focus as much on the ground poles as on the jumps. He also has to be aware of his vision. As soon as the rider looks down, he ruins his position, loses his connection with the horse; his actions become disorganized and out of phase with the situation. So it’s necessary to come out on top of the exercise mentally and physically with the correct panoramic vision. The rider must be aware of everything and above all of his mind-set to get rid of all the irrelevant thoughts that could disturb his interventions. The exercise is to be practiced on both hands of course. The rider and the horse can be more comfortable on one side than the other. Even though it’s important to accept some mistakes, as we go along, the aim is to solve the issues and to balance the right and left side work. The height of the fences has to be adapted to the level of riders and horses. The point of this exercise isn’t into a physical performance or into the height of fences. But rather, it is into the rider’s ability to control by his mind and his body his path, his speed and the balance of his horse.